The season is once again over before March, and questions swirl around the program. The fellas dive into the good, the bad, and the ugly from the 2017-18 campaign and offer up hope for the future. When awards are announced for the Patriot League, there's a good chance that Alex Petrie of Lafayette will win the rookie of the year — and he's deserving. He's had a great year. That result, however, would mean that for the second consecutive year, a standout American freshman is passed over for the award. Last year, Sa'eed Nelson. This season, Sam Iorio. American fell to Bucknell 80-61 on Saturday in the regular-season finale, dropping the Eagles to 6-23, 3-15 in the Patriot League. Head coach Mike Brennan and sophomore guard Sa'eed Nelson spoke afterward. See below for select quotes. American sputtered in the second half at Holy Cross, losing 70-64 on Wednesday to fall to 6-22, 3-14 in the Patriot League heading into the regular-season finale vs. Bucknell. Here are five key plays/sequences from the game. It's hard to believe that one week from now we'll be dissecting the Patriot League Tournament bracket. This conference season has flown by. With just two games left, here's our final edition of Patriot League Power Rankings. As always, feedback is welcomed! 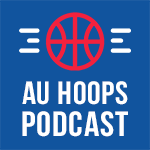 Tweet at us at @auhoopspodcast.